Generour local businesses recently donated funds for protective vests for Bristol County’s three newest police dogs. From left are Officer Kenny Almeida and his partner Will, Officer Scott Robbins and Jerry, and Officer William Dillingham and Sharpy. Bristol County Sheriff’s Office K9 Officer Kenny Almeida has three children, and he always wants to make sure they are as safe as possible. That’s why he so grateful to the generous donors who purchased a bullet- and stab-resistant vest for his four-legged partner Will. Paul Palmariello of Regency Police Supply in Hyannis was at the Dartmouth correctional complex last month to present protective vests to Officer Almeida and Will, as well as Officer William Dillingham and his partner, Sharpy, and Officer Scott Robbins and his partner, Jerry. Dr. David and Jane Askew of Dartmouth Dental, and Michael Panagakos of Panagakos Development donated the funds to purchase the vests. The vests, manufactured by Armor Express, are light (weighing less than 10 pounds) and easy to put on in an emergency situation. An officer can have the vest on his dog in a matter of seconds. The vests also carry the same ballistic rating as the vests worn by Bristol County’s human officers. 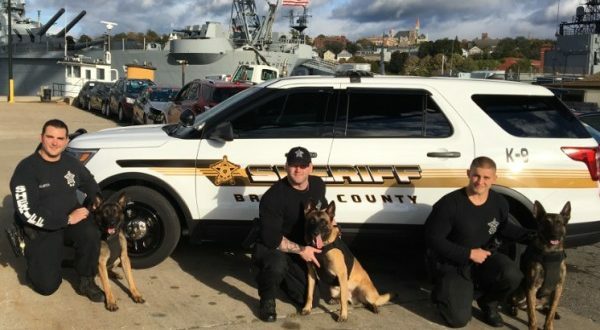 Each of Bristol County’s eight police dogs are now equipped with protective vests. The new models for Sharpy, Will and Jerry retail for around $1,000. The Sheriff’s Office K9 program is available to assist state, local and federal law enforcement in every community in Bristol and surrounding counties 24 hours a day, seven days a week, 365 days a year.